The Challenge—Most geological phenomena are extraordinarily complex in their interrelationships and vast in their geographical extension. Ordinarily, engineers and geoscientists are faced with corporate or scientific requirements to properly prepare geological models with measurements involving a small fraction of the entire area or volume of interest. Exact description of a system such as an oil reservoir is neither feasible nor economically possible. The results are necessarily uncertain. Note that the uncertainty is not an intrinsic property of the systems; it is the result of incomplete knowledge by the observer. The Aim of Geostatistics—The main objective of geostatistics is the characterization of spatial systems that are incompletely known, systems that are common in geology. A key difference from classical statistics is that geostatistics uses the sampling location of every measurement. Unless the measurements show spatial correlation, the application of geostatistics is pointless. Ordinarily the need for additional knowledge goes beyond a few points, which explains the display of results graphically as fishnet plots, block diagrams, and maps. Geostatistical Methods—Geostatistics is a collection of numerical techniques for the characterization of spatial attributes using primarily two tools: Probabilistic models, which are used for spatial data in a manner similar to the way in which time-series analysis characterizes temporal data, or pattern recognition techniques. The probabilistic models are used as a way to handle uncertainty in results away from sampling locations, making a radical departure from alternative approaches like inverse distance estimation methods. Differences with Time Series—On dealing with time-series analysis, users frequently concentrate their attention on extrapolations for making forecasts. Although users of geostatistics may be interested in extrapolation, the methods work at their best interpolating. This simple difference has significant methodological implications. Historical Remarks—As a discipline, geostatistics was firmly established in the 1960s by the French engineer Georges Matheron, who was interested in the appraisal of ore reserves in mining. Geostatistics did not develop overnight. Like other disciplines, it has built on previous results, many of which were formulated with different objectives in various fields. Pioneers—Seminal ideas conceptually related to what today we call geostatistics or spatial statistics are found in the work of several pioneers, including: 1940s: A.N. Kolmogorov in turbulent flow and N. Wiener in stochastic processing; 1950s: D. Krige in mining; 1960s: B. Mathern in forestry and L.S. Gandin in meteorology. Calculations—Serious applications of geostatistics require the use of digital computers. Although for most geostatistical techniques rudimentary implementation from scratch is fairly straightforward, coding programs from scratch is recommended only as part of a practice that may help users to gain a better grasp of the formulations. Software—For professional work, the reader should employ software packages that have been thoroughly tested to handle any sampling scheme, that run as efficiently as possible, and that offer graphic capabilities for the analysis and display of results. This primer employs primarily the package Stanford Geomodeling Software (SGeMS)—recently developed at the Energy Resources Engineering Department at Stanford University—as a way to show how to obtain results practically. This applied side of the primer should not be interpreted as the notes being a manual for the use of SGeMS. 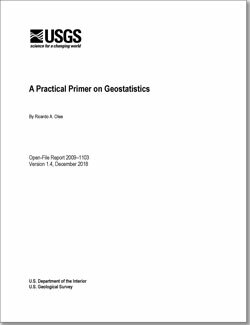 The main objective of the primer is to help the reader gain an understanding of the fundamental concepts and tools in geostatistics. Organization of the Primer—The chapters of greatest importance are those covering kriging and simulation. All other materials are peripheral and are included for better comprehension of these main geostatistical modeling tools. The choice of kriging versus simulation is often a big puzzle to the uninitiated, let alone the different variants of both of them. Chapters 14, 18, and 19 are intended to shed light on those subjects. The critical aspect of assessing and modeling spatial correlation is covered in chapter 7. Chapters 2 and 3 review relevant concepts in classical statistics. Course Objectives—This course offers stochastic solutions to common problems in the characterization of complex geological systems. At the end of the course, participants should have an understanding of the theoretical foundations of geostatistics; a good grasp of its possibilities and limitations; and reasonable familiarity with the SGeMS software, thus opening the possibility of practically applying geostatistics. Olea, R.A., 2018, A practical primer on geostatistics (ver. 1.4, December 2018): U.S. Geological Survey Open-File Report 2009-1103, 346 p., https://doi.org/10.3133/ofr20091103/.